American Secretary of State Rex Tillerson has increased pressure on Pakistan over its perceived backing for the Taliban in Afghanistan. Pakistan denies sheltering the Taliban, but Mr Tillerson suggested it could lose US privileges if the government failed "to change their posture". He was speaking a day after President Donald Trump unveiled a new strategy, vowing to commit US forces to back Afghan forces fighting the insurgents. The US is a key ally of Pakistan. The country enjoys a special status as a non-Nato alliance partner and has received billions of dollars in aid. But Mr Tillerson said this "could be on the table for discussion if in fact they are unwilling to change their posture or change their approach to how they are dealing with the numerous terrorist organisations that find safe haven in Pakistan. "It is in Pakistan's interest to take those actions." Mr Tillerson also stressed that having a stable Pakistan was in US and other countries' interests. "They are a nuclear power and we have concerns about the security of their weapons. This is not a situation where the US is saying 'this is us and you'." 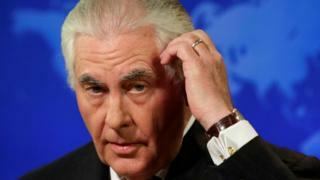 Mr Tillerson said the Taliban must be made to understand that they could not win a battlefield victory in Afghanistan. But he suggested the US might not either. "We may not win one but neither will you," as he put it, adding that negotiation was the way to bring the conflict to an end. Pakistan has for years deflected US criticism over the issue of safe havens for Taliban and other militants active in Afghanistan. That's partly because Islamabad sees the groups as leverage to prevent its arch-rival India from gaining influence there. It's unlikely that the Trump administration will be able to change Islamabad's strategic calculations, especially as the president has now encouraged India to play a greater role in Afghanistan. Rex Tillerson did mention ways that Washington could press Pakistan, such as withholding military aid and reassessing its status as a major non-Nato US ally. But he also acknowledged concern that too much pressure could destabilise Islamabad. He offered US help to deal with any blowback from a crackdown on the militants. And he suggested that India take some "steps of rapprochement" to ease Pakistan's concerns. 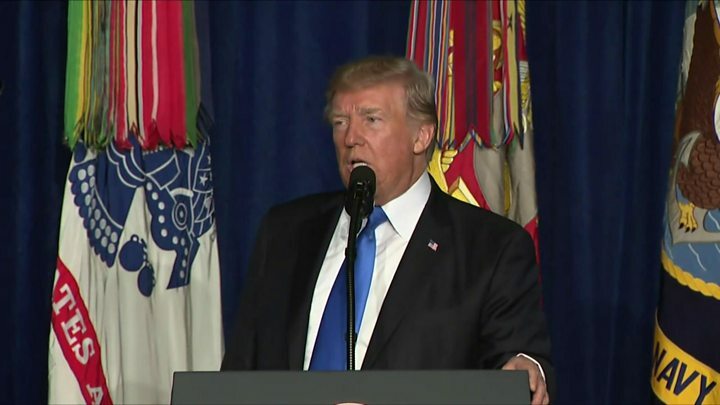 On Monday night, Mr Trump unveiled a new Afghan strategy, committing the US Army to the open-ended conflict, despite previously advocating its withdrawal. President Trump warned a hasty US withdrawal from Afghanistan would leave a vacuum for terrorists to fill and said he had decided to keep troops there to "fight to win" to avoid the mistakes made in Iraq. He said his new approach would be more pragmatic and based on conditions on the ground rather than idealistic and time-based, and would switch from nation building to "killing terrorists". But Mr Trump refused to be drawn on how many extra troops, if any, would be deployed and gave no timeline for ending the US presence in the country. Washington is thought to be ready to send up to 4,000 additional troops. Mr Trump also, for the first time, left the door open for an eventual peace deal with the Taliban, saying: "Someday, after an effective military effort, perhaps it will be possible to have a political settlement that includes elements of the Taliban in Afghanistan." Pakistan's foreign office denied the country allowed militants to operate from its soil. "Instead of relying on the false narrative of safe havens, the US needs to work with Pakistan to eradicate terrorism," a statement said. Afghan President Ashraf Ghani thanked the US for supporting "the joint struggle against the threat of terrorism" in Afghanistan. 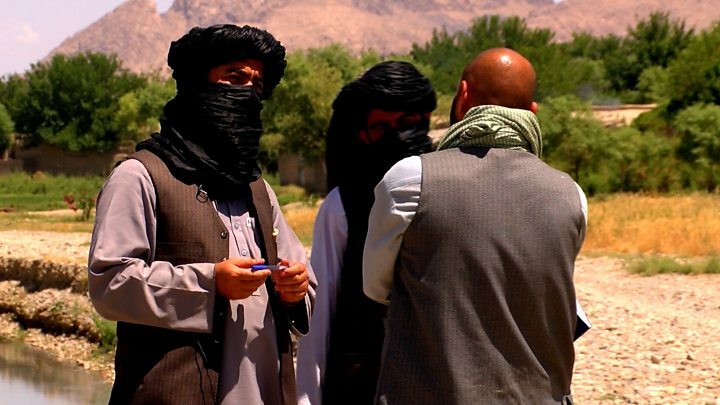 The Taliban promised to make Afghanistan a "graveyard" for US forces. India's foreign ministry said it shared Mr Trump's concerns over safe havens and "other forms of cross-border support enjoyed by terrorists". US combat operations against the Taliban officially ended in 2014, but more than 8,000 special forces continue to provide support to Afghan troops.